My MacBook is at the Apple Store receiving a new logic board from a “genius”, so I am without current knitting photos for a few days. To tide you over, I thought I’d share a few “firsts”: my puppy and my knitting. Here is my first project: a multi-colored garter stitch scarf made from several shades of Cascade 220. (We’ll ignore my childhood pot holders for now.) I thought these colors would be pretty together, but not so much. In pairs, they look great, but all three don’t really do it for me. 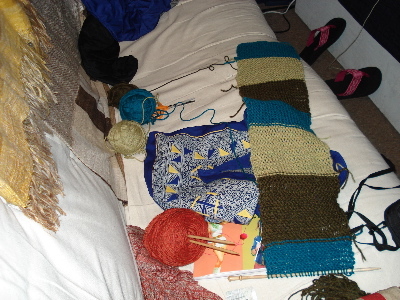 In real life, the lighter green is brighter, and the stitches are a bit too loose for a hearty scarf. You may notice that two of these yarns became the pom-pom garter brim hat I wear whenever the weather warrants ear coverings. I still have this, but it stays inside, if you know what I mean. Hard to believe this was just over 9 months ago. This is Bohpenyang, my puppy, on the day we met. 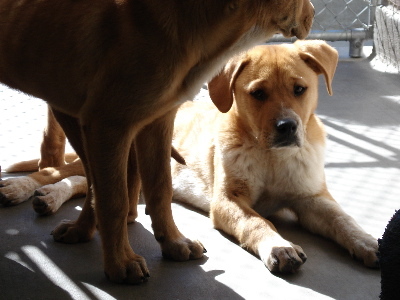 He looked so sad at the shelter that I wasn’t sure he was the one for me. I’m glad we went for it. I know it sounds sort of ridiculous when I say it out loud, but I can barely remember life without my dog. It is a truly wonderful thing to build a relationship with such a loyal, quirky companion. This entry was posted in knitting and tagged , beginnings, garter stitch scarf, knitting, puppy by barefootrooster. Bookmark the permalink.